The Aura Blue Glow in the Dark Thinking Putty is hypnotic and irresistible! Milky white in daylight, their glow magically appears when the lights dim. You can use our Blacklight Keychain to write messages on the putty and draw special designs. 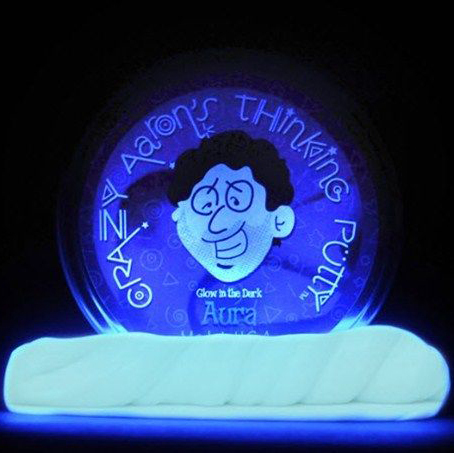 You can even do cool tricks with Crazy Aaron's Glow in the Dark Thinking Putty. After exposure to light (the brighter, the better),these colors will glow for hours. Crazy Aarons Brilliant Shiny Mint Green 4 Inch Tin Foxfire. Crazy Aarons Gunmetal Graphite Metallic 4 Inch Putty for play and stimulation.